1. 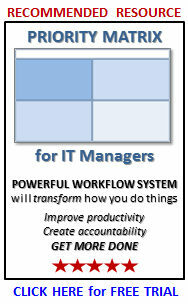 Are you completing your IT strategy? Hopefully you are making great progress in completing the big items planned for this year. If not, you need to step up the pace, , , five months has passed very quickly and the end of the year will be here before you know it. 2. How is your budget looking? Better check where you stand with your budget and forecast out the trends of your major expense categories. If you are already behind in achieving your budget for the year, you need to make corrective action quickly, , , waiting until September or October will be too late. If you see certain expenses trending higher than what they need to be to make your plan, , , anticipate the result and make corrections as needed to achieve your plan. 3. Are you taking care of your people? Have you done anything nice for your staff this year? The next few months is a good time to do something. Take care of your people and they will be motivated and encouraged to take care of you. It doesn’t require lots of money, , , just pay attention to them and do something fun from time to time and show them you appreciate their efforts. Telling them you appreciate them is also very helpful. 4. Does senior management know what you are doing? 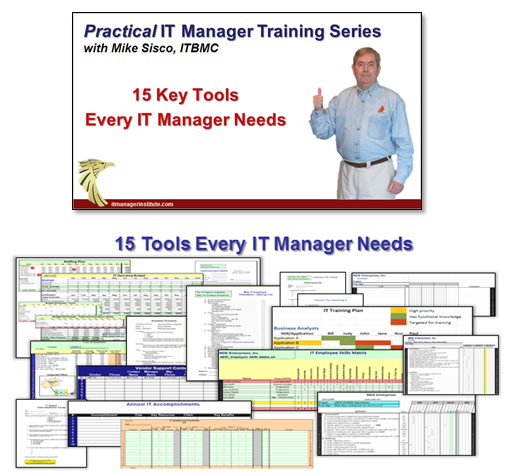 Are you communicating with senior management and department managers so they know what your IT organization is getting accomplished, , , and are you translating these successes into business value components where they will “get it”. If you don’t know what I mean by “business value”, read the post titled, Business value is key. 5. How are your clients feeling about IT support? Are your clients happy with what you are doing or do you know? If you aren’t sure, now is a good time to check with them to insure your team is on course for a successful year. Mid-year inspections are valuable to help ensure you achieve what you want to achieve this year. The freshness of a new year has worn off by now and we are now into the drudgery of the work, , , it’s time to highlight some things and create renewed focus on what you and your team are trying to get accomplished this year. Your staff and you may be getting a bit tired or a bit down so make it a point to do something that shows you appreciate them. Have some fun. Staff will begin taking vacations, , , be sure they do so they can come back fresh and ready to go. Be certain you do this for yourself, , , and when you take vacation, try to actually take a true leave of absence and get completely away from the work. It will help you and make you more productive when you return. Assess where you are, make adjustments as needed, and push forward to make the progress you need to make this year. They boost productivity, make things easier, or are just fun to have. Whether it is a GPS device, a golf range finder, imaging software, iPad app, new headphones, or a Yoda flash drive, , , we like our “toys”. I want to hear about the gadgets you like the most. Post a comment to this post and tell me about your favorite gadgets, , , and do not assume everyone knows about it. I can guarantee the simplest thing you have will be new to many of us. Read my story below and you will see why I say this. My brother, Mark, is a great guy with lots of knowledge. He has worked on some extremely large projects and traveled to many parts of the world as a result like China, Scotland, Ireland, and France. I’m always learning new things from him, , , especially about new technology gadgets, photography, etc. He has a lot of knowledge about many things. His youngest daughter graduated from high school last Thursday and we went to his house afterward for a little celebration. As I entered his home, Mark tells me he has this great new gadget he is very excited about. I’m always interested when I hear this because he finds some truly great things, , , and for him to be excited about it means it will be something truly special. What shocked me was when he showed me a Logitech Presenter, , , a hand-held device that includes a USB component to plug into your laptop’s USB connection. It allows you to page your PowerPoint presentations forward and backward, , , a wireless presentation clicker. Neat – yes, , , it just blew me away that he is just discovering this great little gadget. I’ve been using one for 9 years in my IT Manager Institute class. Don’t know what I would do without it. No cords to fool with and allows me to roam all over the room, , , even includes a laser pointer. Like I said, it is a great tool if you make presentations. The point, , , don’t assume others know what you know. I wrote a post about this topic titled, Others may not know what you know, , , you might want to read it. This incident reinforced with me again just how true this is. If someone had told me Mark would not know about this little gadget, I would have laughed, , , sure enough, the laugh would have been on me. Only wish I had told him about it years ago, , , and I’m wondering what little gadgets he knows about but hasn’t thought to tell me. Mark, if you read this, post a comment and share a couple of your best gadgets. 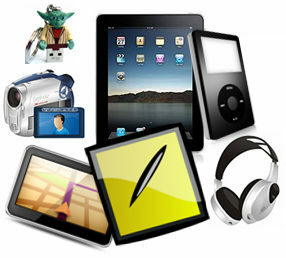 I hope everyone who reads this post will take two minutes to make a comment and share their gadget story. Some of you may not know who Yogi Berra is. 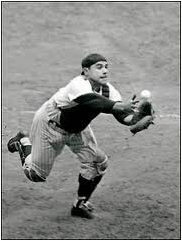 Well, , , he was a famous baseball player who played for the New York Yankees from the late 1940’s to the mid-1960’s. He was a great catcher and was voted Most Valuable Player of the American League three times and hit the most home runs for a catcher by the end of his career. His New York Yankee teams played in 14 World Series winning 10 times, a record at that time for a player. He was a very successful baseball player and one of the most quoted people in the world. But, it isn’t his baseball that made his so famous. 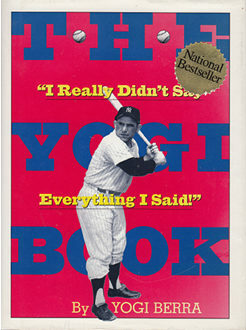 What Yogi is more noted for are the press quotes he was famous for saying. They are unique to say the least. “Nobody goes there anymore; it’s too crowded.” Talking about a restaurant. “A nickel ain’t worth a dime anymore.” One of my favorites! I have a copy of this book sitting in my office and pull it out ever now and then when I need a break from the work. Yogi took his profession seriously but he wasn’t so serious to forget about the fact there are other things important in your life. He was successful and had a sense of humor. Wouldn’t you have to have a good sense of humor if you said these things? 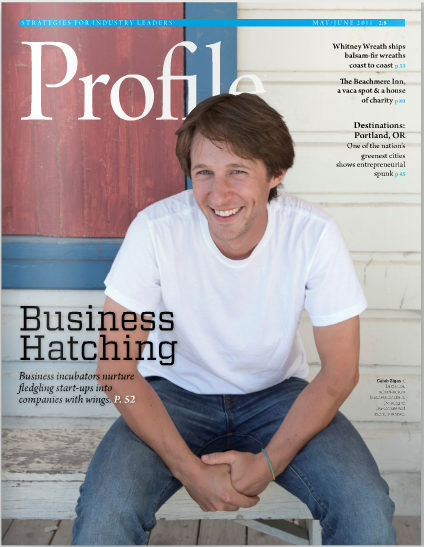 Our company was highlighted in the May/June edition of Profile Magazine. Check them out at www.profilemagazineonline.com. Remember when you were in school and they created a class yearbook? 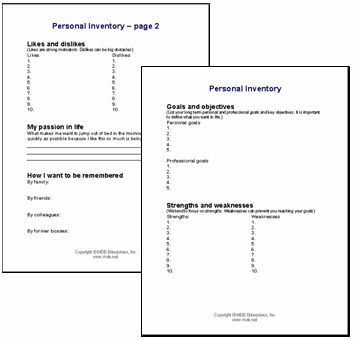 They are great for retaining memories for a lifetime. One of the things I wish I had are some of the memories of my professional life. I have a few but not as many as I would like. Right now, you may be experiencing one of the best times of your entire career but don’t yet realize it. I can remember three specific situations that I consider to be the “best of my career”. Unfortunately, I have only my personal memories. It would be nice to have more photos and memorabilia from these special times. Have you ever thought about creating a company album? I’m not talking about a photo album where you insert photos in plastic pages, , , I’m talking about full color high quality “coffee table” books made up of whatever topic and design you choose to create. The publishing business has turned upside down with the innovation of technology, , , I mean completely upside down. In a matter of a few hours, you can create a high quality photo book of any subject you like and have it sitting in your office in a few days, , , and at an unbelievable cost. All you need are the photos or images and your creative imagination. I did this one of my son in less than an hour. I wasn’t trying to be very creative, , , we just wanted a hard copy of a few of his photos to share with friends. It made great Christmas presents. CLICK HERE to view. With digital photography, it is simple and easy to do, , , and extremely economical. Plus you can make your book available online to anyone for free, or they can order a real book for themselves. My wife and I have created 5 or 6 of these “photo books”, and they are very special to us. My brother created three books about his 2-week trip to Italy. I’m about to create another for a very special gift to my wife. In fact, creating one for a Christmas gift is what got me interested in them. 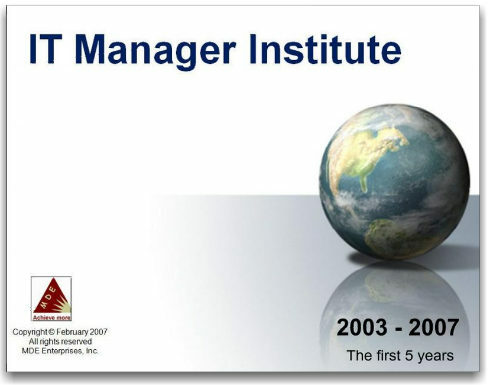 I have one to remember my IT Manager Institute classes, , , a very special time in my life. 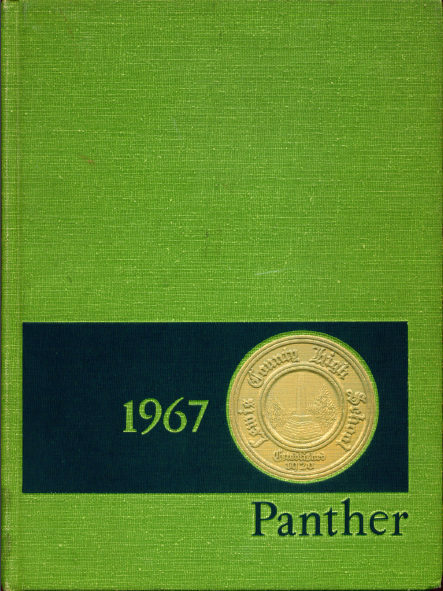 CLICK HERE to view the book I created for the first five years of the program. At the end of 2012, I plan to create another for the next 5 years. I wish I had one for each of the great company experiences I’ve had in my career. Our friends are amazed at our ability to do some of the things we do, , , like create nice photo books we can share with them. They don’t know how to even start to do this but would really like to. As an IT organization, your clients and users are often in the same predicament as my friends, , , they don’t realize what can be done and even if they did, they wouldn’t know where to start or would be too intimidated by the technology to do it. I tell my friends, “If I can do this, the technology can’t be that difficult.”, , , but because they know my IT management background, they think I’m very technical. 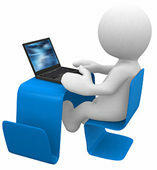 It’s the farthest from the truth, , , the fact is, they are intimidated by technology so they don’t try. Your CEO might be very interested in something like this as a way to create company cameraderie or give as a gift to employees, , , or to sit in the lobby for guests to browse through. We use MyPublisher.com, but there are many to choose from. Simply do a keyword search on “photo books” and you will find several. 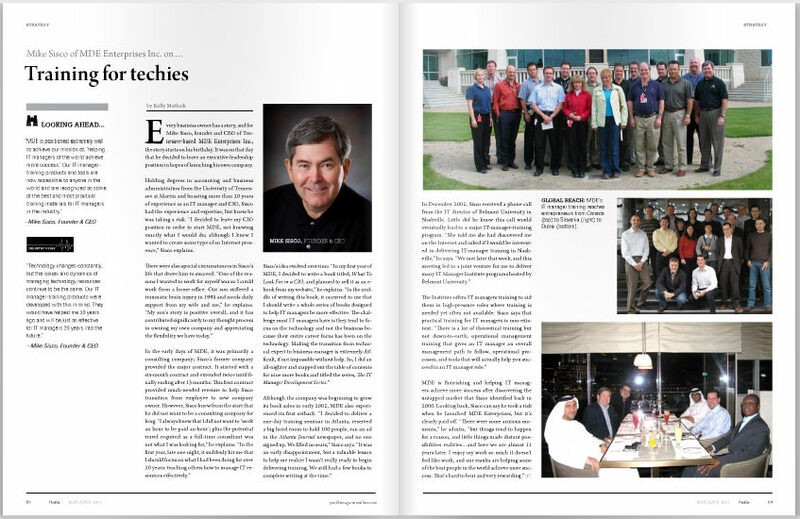 I chose MyPublisher because of the creative flexibility with the layout and the price. They are always promoting special discounts and that’s when we usually order. 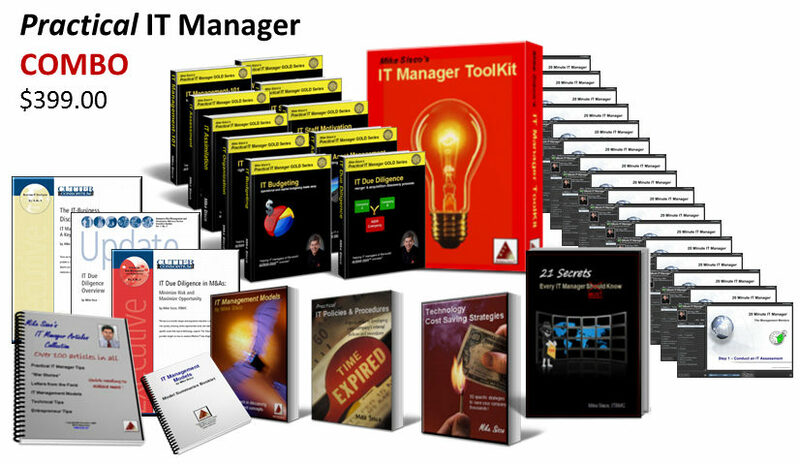 For example, they are running a Father’s Day special right now that would cut the cost of my IT Manager Institute book by two-thirds. It’s a 96-page, full color hard bound book with dust cover, , , my price to reorder would be about $40.00. Now that’s a great bargain. The other great thing is that when you publish a book for yourself, they give you a link to share the online version with your friends. They do this to advertise their service, but what a great deal. Who knows, , , this concept might even be a promotional idea your company could use. When people view an online book, they can view the entire book for free or order a hard copy for themselves if they wish. This is nice if you don’t want to be in the order taking and fulfillment business. A product like this would have cost $500.00 or more ten years ago. 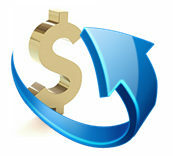 Today with the innovations in the publishing industry, it’s very inexpensive. Take a look at the albums I shared with you and consider developing a Company Album, , , it might go over extremely well with your senior managers and marketing people. You have to see one to believe how great the quality is, and it is a treasured product that will last a lifetime. Do you prefer to take the lead and put yourself out front and willing to take a risk if what you do does not succeed? Or do you prefer to avoid taking risks and follow someone else’s lead? It is OK to be either type, you know, , , even in a management position. Some managers are better executioners of project initiatives than being able to develop strategy and getting senior managers to buy in. It can be due to a lack of salesmanship, , , lack of confidence, , , or just not knowing how to go about it. A follower can become a leader if he wants to. 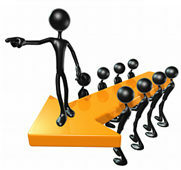 Becoming a leader is simply a matter of learning what to do, how to go about it, , , and having tools that help you lead. Confidence comes with knowledge, , , and knowledge comes either from gaining experience or by investing in learning from others who have the experience. Leadership traits are not something you just flip a switch and “turn on”. We wish it could be so easy. What I believe happens is that you start investing in your knowledge and learn about leadership techniques and traits of leaders, , , and as you begin using this new-found knowledge in your work, , , you wake up one day and you are leading instead of following. It’s not magic, , , it just happens as you begin doing things that leaders do. Others are following your lead, , , and no one knows when the change took place in you although everyone realizes you went from following to leading. Some people make the transition faster than others. I don’t know that there is a time line that matters. The key here is that to become a leader, you make a decision to become a leader, , , you invest in learning how to take the lead and start doing things a leader would do and begin using tools that helps you lead. It is always your decision in the long run, and like I said earlier, , , it is OK to be a follower, even in a manager role. 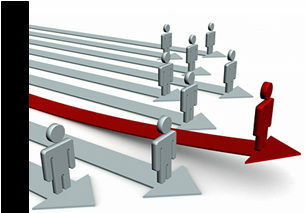 If you decide to become a leader, , , invest in a mentor who can assist you in your transition.